To Hilda on the "Ships starting with H" page. Delivered in Aug.-1925 from Trondhjems mek. Verksted A/S, Trondheim as Hilda (189) to A/S Djerv (Bachke & Co.), Trondheim. 1236 gt, 670 net, 1875 tdwt, 237' (loa) x 36' 4" x 16' 8", Triple exp. steam engine, 690 ihp. A. Hague has included Hilda in the U.K.-Norway Convoy ON 19 in the middle of March-1940. Note that there's also a ship by this name listed in the earlier Convoy HN 14 from Norway to the U.K., but A. Hague has given her nationality as Finnish (1144 gt, built 1915). Hilda was in Sweden when the Germans invaded Norway on Apr. 9-1940. Requisitioned by Nortraship in Apr.-1940. Requisitioned by the Swedish Government on October 25-1940, and traded for the Swedish State Traffic Commission under the Swedish flag. My page Ships in Sweden has a list of, and information on the Norwegian ships there at the outbreak of war in Norway. 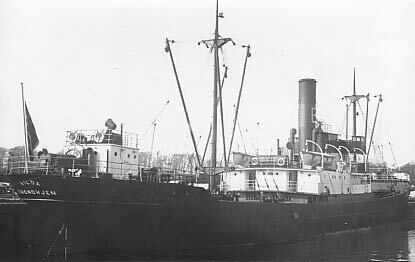 Hilda was bombed and sunk by British aircraft on Oct. 21-1941, while in a German convoy, on a voyage from Rotterdam to Gothenburg with a cargo of coal. No casualties. Charles Hocking (see My sources) says she was on a voyage from Bremerhaven to Rotterdam at the time. The Bachke & Co. fleet list states she was requisitioned by Svenska Statens Trafikkommision (Swedish State Traffic Commission) in Apr.-1941. Back to Hilda on the "Ships starting with H" page. There was also a Finnish ship by this name, torpedoed and sunk by a German U-boat off the coast of Spain on June 21-1940. The text on this page was compiled with the help of: "Nortraships flåte", J. R. Hegland, Bachke & Co. fleet list, Finn R. Hansen and misc.